This article is about the Subspace Emissary side-scrolling stage. For the multiplayer stage, see Skyworld. Mario and Pit join forces on Skyworld. Skyworld (天空界, Skyworld) is the second stage in Super Smash Bros. Brawl's adventure mode, the Subspace Emissary. It begins with a cutscene first shown on the Smash Bros. DOJO! !, where it was titled Pit's Descent. A cutscene opens the stage, Pit is shown viewing the fight between Mario and Kirby, waving his fists excitingly before seeing the explosion of the Subspace Bomb in the Midair Stadium from Skyworld. The goddess Palutena appears and Pit turns around and sees her. Pit then runs over to her and kneels before her. Palutena then sends him to attack the Subspace Army, giving him her bow. Pit leaves and glides down to a lower level of clouds. The stage begins as the player is controlling Pit. The player has to glide down the clouds. After the player drops all the way down, Pit will later land on a platform and some clouds he can walk on. In the following cutscene, Pit sees the Battleship Halberd. The Halberd descends through dark red clouds, dropping Shadow Bugs around him, which form Primids. After defeating all the foes, the player runs right along the platform. Partway through there is another platform with an orange cube on it. The player continues, eventually encountering a Greap that must be defeated. After defeating it, a door will appear. 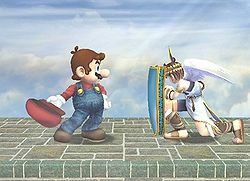 In this cutscene, Pit notices Mario's trophy in the clouds and revives Mario in the blink of an eye. Mario has a flashback to his meeting with the cannonball again. He then sees Pit and they team up from this point forward. The player has to select a character for the next segment between Mario and Pit. The player will start dropping through the clouds, and there is a course to travel. Once the player falls down for a while they will eventually land on a purple cloud that they can't drop through. Instead, one can ride it as it heads towards the right. It only lasts for a few seconds. The player then lands on a brick platform and is met with some Jyks. The player then has to travel across a section full of enemies. They will eventually come to a section with rising and falling pillars. Once the player reaches the 3rd pillar, they can stop and wait for it to fall down as it will reveal a hidden door behind it. The player must continue. As the player continues to the right, they will meet a forced battle with groups of foes. After all the enemies are beaten, the golden door becomes visible. After passing through the door the stage is clear. After the stage completed, Mario and Pit glimpse the Halberd and an Arwing flying after it. At this point, Mario and Pit will join the player's team. During the first part of the stage, Underworld plays. During the second part of the stage, Skyworld plays. During the third part of the stage, Underworld plays again. Despite not being pulled into Subspace, Skyworld still appears in the Great Maze. This page was last edited on August 24, 2015, at 11:35.